If you itemize deductions on your tax return then mortgage interest is tax-deductible. In general, the higher your tax bracket, the greater the potential benefit of a mortgage. Once retired, your tax bracket is likely to be lower. Before deciding to pay off your mortgage early, consider the tax impact of your mortgage both before and after retirement. If you are a working-age adult in a higher tax bracket and you itemize tax deductions, you can take advantage of a form of "tax arbitrage." Tax arbitrage is a fancy way of describing legal transactions you can use to take advantage of tax incentives. For example, while working, you can choose not to make any extra payments on your mortgage and instead take full advantage of contributions to tax-deductible retirement accounts, like 401(k) plans, 403(b) accounts, or by making deductible contributions to traditional IRA accounts. This tax saving technique works if you are able to deduct the interest you pay on your mortgage AND deduct the contributions to tax-deductible retirement accounts. This strategy is of the most benefit to those in the highest tax brackets. If that is you, then paying extra on your mortgage may not be the best financial decision you can make unless you are already maxing out tax-deductible contributions to retirement plans. Don’t make this decision solely based on taxes. You will also want to consider the level of investment risk that you are comfortable with compared to the ​risk-free return of paying off your mortgage. In general, higher net worth/higher income families can benefit from the smart use of debt, while lower income/lower net worth families are better off when they focus on paying down debt. In addition, you want to create a balance between taxable and tax-deferred investments; if you don't, tax-deferred investments can end up hurting you in your retirement years. Once retired, your tax situation may change. It is more likely you will be in a lower marginal tax rate. If this is true, then, the mortgage interest rate deduction will not provide as great a benefit to you. For example, if you were in the 33% tax bracket while working, but now in retirement, your tax rate is only 15%, then each dollar of deductible mortgage interest is now saving you 18 cents less than it did when your tax rate was higher. In addition, if you have investments in taxable accounts, the interest from these investments will increase your modified adjusted gross income and may affect the amount of taxes you pay on your Social Security retirement benefits. 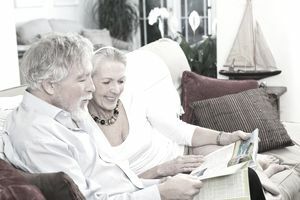 Depending on your personal tax situation, once you are retired, it may make sense to re-position taxable investments to pay off your mortgage, which may reduce your taxable income to the point where you will pay less tax on your Social Security benefits. If you are thinking of withdrawing investments from tax-deferred retirement accounts to pay off your mortgage, use caution. Withdrawals from tax-deferred accounts are included in your taxable income in the year you take the withdrawal. This means if you take a large chunk of money out of an IRA or 401(k), the extra income could bump you into a higher tax bracket. You can potentially avoid this by breaking up large withdrawals into smaller increments to be withdrawn over several calendar years. For example, you could withdraw funds in December, then immediately the following January, then again the following January, thus taking funds out thirteen months but spread out over three calendar years. By thoughtfully using your mortgage as a financial tool, you can determine the most tax-efficient time to pay it off. Is Your Mortgage Interest Tax Deductible?